So we were on the bus. This week had involved being crook, travelling back from Australia and kiboshed days out for our little posse of salmons (don't ask). Next thing we know, we're on an impromptu trip to Manchester not having a clue where we wanted to eat. The areas of interest were 'new and exciting' or 'old and trustworthy'. We opted for a clever middle ground with Iberica. 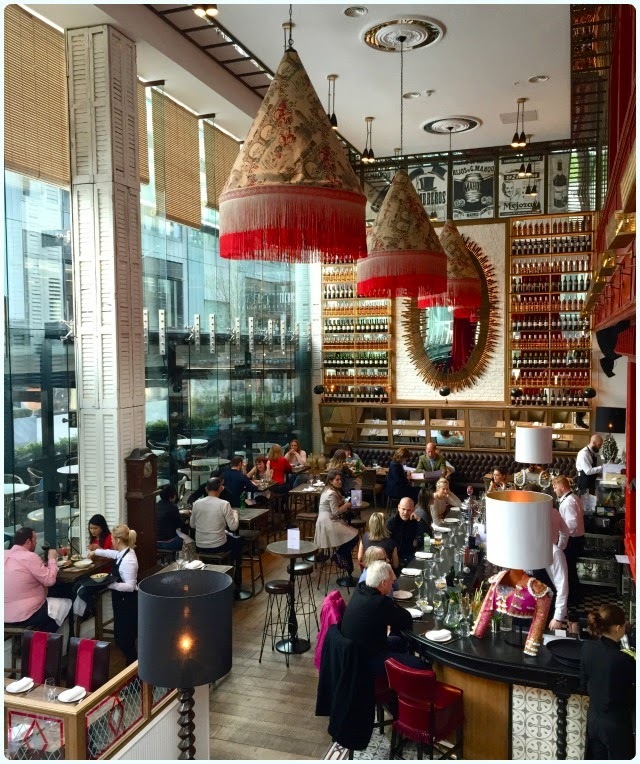 A few weeks ago, Lee and I had already visited Iberica Marylebone, and saw that it was wonderful. We decided Clare needed to experience the same, so opted to go to their new spot in Spinningfields. Clare's a veggie, so I like going somewhere with lots of choice for her when we go out, rather than the standard fungus burger or vegetable lasagne. Boring. 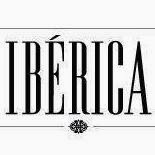 We booked online whilst on the bus, and after a quick pit stop to buy some pretty little things, we arrived at Iberica. There was no sign of our reservation and they were fully booked. After a speedy investigation, it appeared the system had actually booked us in for the day later, but this was quickly resolved by the lovely front of house staff. Check out those lamp shades! There's a beautiful bar area which sits underneath the main dining room upstairs, and also a lovely al fresco spot at the front with branded fleece blankets over the chairs for when it gets chilly. The menu was fully explained, and we set about deciding which dishes we wanted to sample. Manzanilla olives and strawberry and basil gin smash (gin, strawberries, basil, sugar, lime & soda): None of us like olives, but I'm sure that others (who are considerably more grown up than we are) would appreciate these. Cocktails were more up our street. These gin based numbers were very fruity and didn't taste very strong. Probably for the best at lunch, but we are used to something with a little more kick. 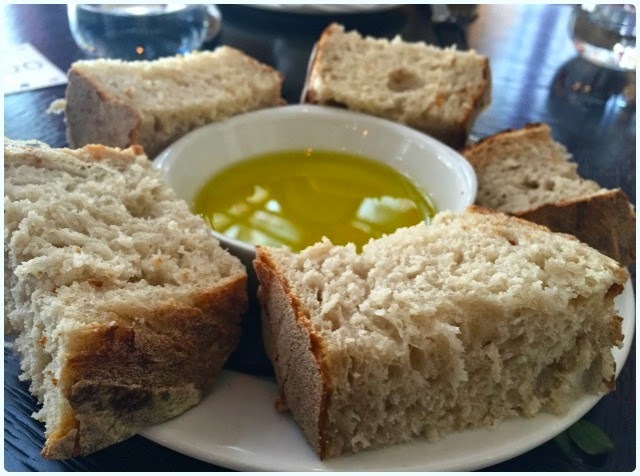 Bread with olive oil: I love a bit of bread. When I was going through my awkward Michelin-star-chasing phase, I always found the pre-meal bread was generally a good measure of how the rest of the menu would pan out. This was soft, fluffy, warm and just heavenly. We ended up ordering another round. The only thing that would have improved it was (dare I say) some Balsamic vinegar. 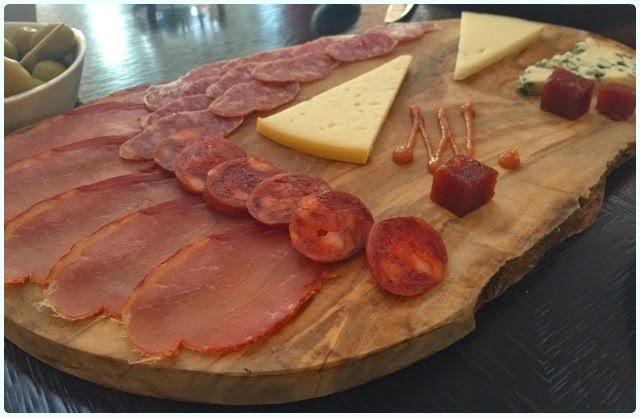 Half and half platter: This is some of the best cured meat I have ever head. Team that up with Manchego and it's a match made in heaven. I adored the sharp quince jelly too. 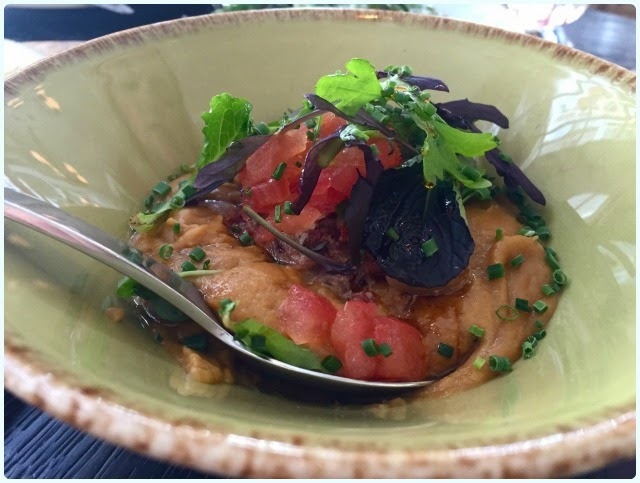 Chickpea puree with chorizo, pancetta and tomato salad: This was by far my favourite item we ordered and was a perfect bedfellow for that warm bread. 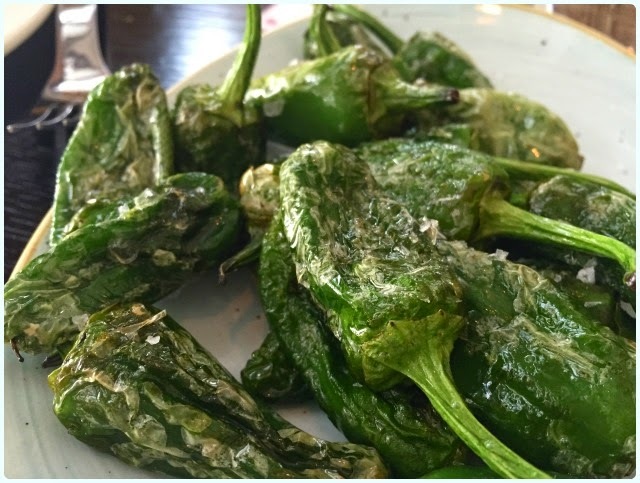 Padrón peppers with Maldon salt: These are very moreish little green items. Some are very sweet whilst others are quite tangy. It also turns out they are hot as hell when they first arrive, so be careful! Potatoes with spicy brava: These looked slightly different to the ones we had in London, but were just as delicious. All three of us enjoyed these. 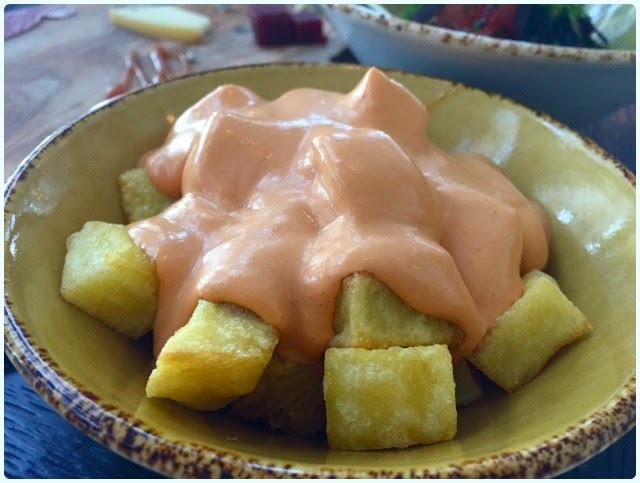 The potatoes were beautifully crisp, and I think I could probably drink that creamy sauce. 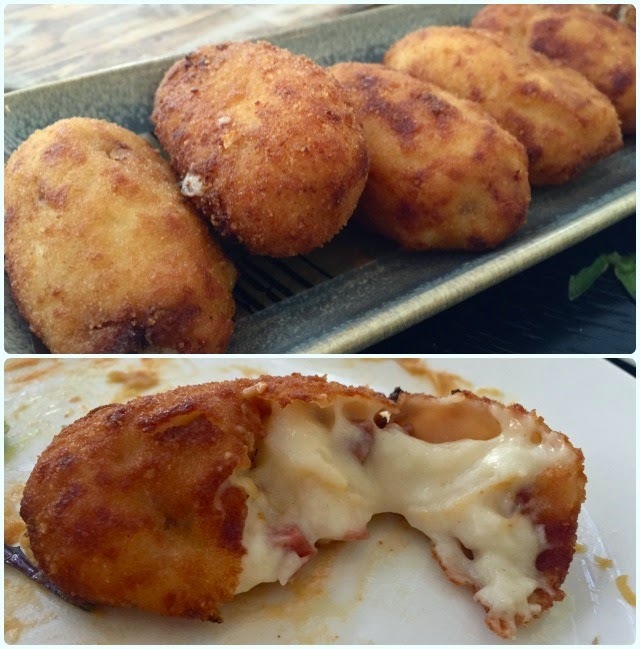 Ibérica’s Serrano ham croquettes: Cheese and ham fried in breadcrumbs. You're dead inside if these don't excite you. Even veggie Clare looked longingly at them. She was only put off trying a cheesy bit by the threat of potential 'ham juice'. 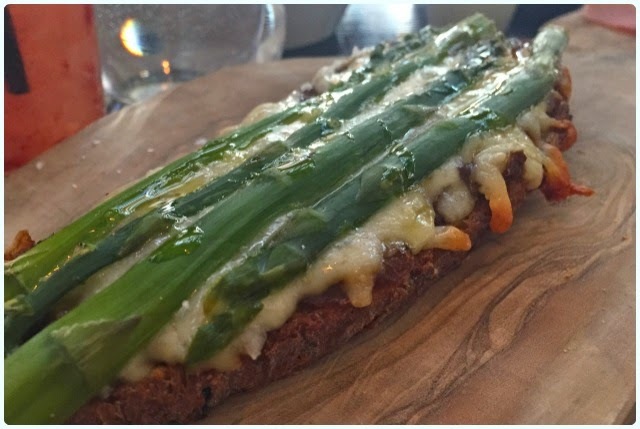 Asparagus, Manchego, onion confit and truffle oil toast: The poshest cheese on toast in town with a generous amount of truffle oil and cheese. Lots of flavour for a dish sans meat. 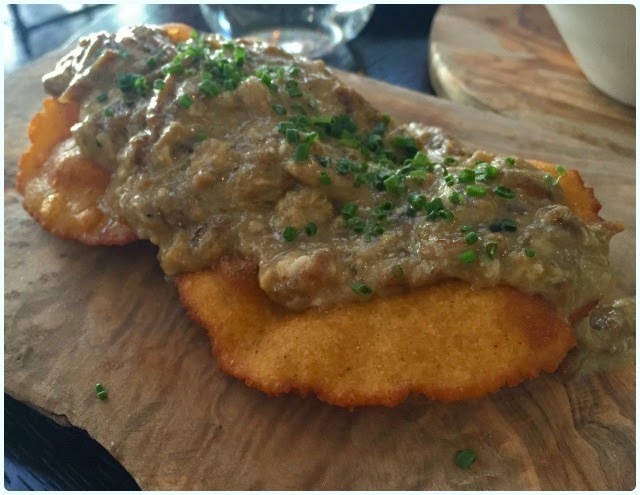 Corn torto fritter with Cabrales cheese and scrambled egg: Very cheesy with a perfectly crisp fritter. You only needed a little bit of this because the flavours were so huge. 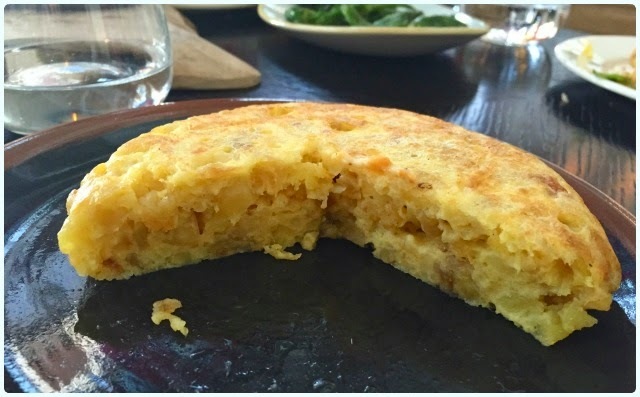 Traditional Spanish omelette: Looks yellow and a bit boring, but this was actually one of my favourites. It was quite firm because of the potato, but was a nice accompaniment to the other dishes. 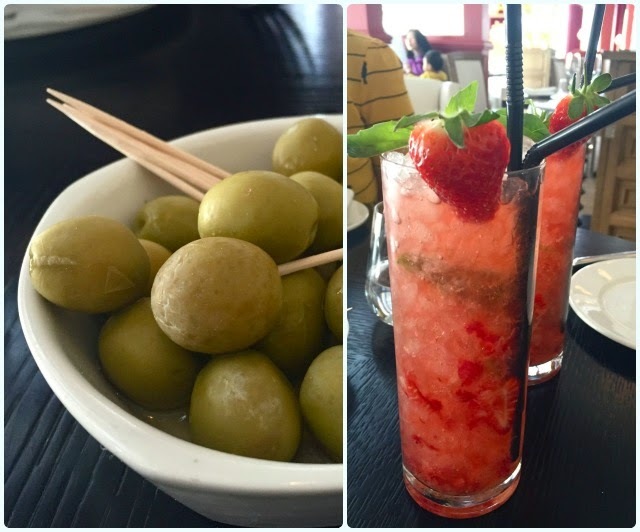 We had a delightful little afternoon in Iberica. The service was attentive and the food arrived quickly, but in several stages so as not to over-face us. The only thing that we noted was the very springy floor, which became quite distracting as the restaurant got busier. I'm sure this wouldn't be as much of an issue if you're sat in the tiled booths. We also had a slight issue with the service charge being added to the bill twice, which was quickly rectified. We may have been defeated by the amount of food and felt very sleepy indeed afterwards, but luckily for us, it was blowing a force ten gale outside which revived us within seconds of stepping out of the door. I'm sure we'll be back again soon.